Join Citizens Union in awarding its 3rd Annual Community Leadership Award to Lucy Cabrera, Liz Neumark, and Karen Washington for their collective work around hunger relief and access to healthy food which is creating a more sustainable city for all. As an independent, nonpartisan civic organization dedicated to promoting good government and advancing political reform in the City and State of New York, Citizens Union serves as a watchdog for the public interest and an advocate for the common good. For more than a century, we have worked to ensure fair elections, clean campaigns, and open, effective government that is accountable to the citizens of New York. Believing that an informed citizenry is the cornerstone of a thriving local democracy, Citizens Union Foundation – the research, education, and advocacy organization affiliated with Citizens Union – publishes GothamGazette.com, a front row seat to New York City policy and politics. 212-228-7446 x15 or [email protected]. 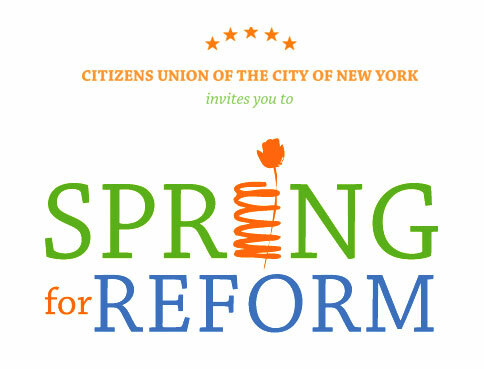 Gifts to Spring for Reform support Citizens Union’s work to shape and promote legislation that serves the public interest. Given the nature of this work, contributions are not tax-deductible. For more information contact Bethany Wall at 212-227-0342, x16.